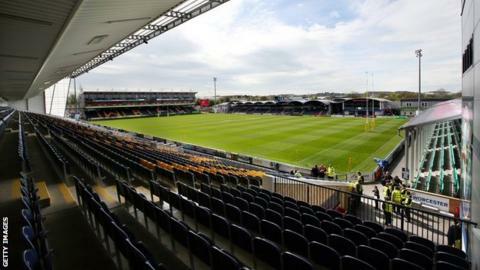 Bristol gained a big psychological advantage going into the Championship play-offs after handing Worcester their first home defeat in 13 months. Worcester led 13-7 at half-time after centre Max Stelling quickly cancelled out Auguy Slowik's eighth-minute try, followed by two Ryan Lamb penalties. Cooper Vuna then scored for Worcester, but Bristol hit back with tries from Ben Mosses and Charlie Amesbury. And Nicky Robinson's two late penalties proved the winning margin. Lamb, who had swapped penalties with Robinson after the break, briefly put Worcester back in front at 26-24 with five minutes left. Bristol set a new record of 103 points for the Championship season, beating the record of 101 points set by Worcester in their 2010-11 title-winning campaign. Worcester have set new Championship records this season for tries scored (122) and 'points for' (858). But the Warriors, who were hampered by the early loss of Stelling (hamstring) and a late Chris Pennell injury, were then made to pay for second-half yellow cards. Both Vuna and former skipper Jonathan Thomas spent 10 minutes in the sinbin - and Robinson held his nerve in front of the partisan sell-out Sixways crowd. That completed a league double over the Warriors by Bristol, who won 23-19 at Ashton Gate on the opening weekend of the season, thanks to a converted try from centre Mosses in added time. Bristol will now play fourth-placed Rotherham in the play-offs, while Worcester will meet third-placed London Scottish over two legs. Assuming both the top two make it through the play-off semi-finals, Bristol will now have home advantage for the second leg on 27 May. Worcester: Pennell; Biggs, Stelling, Mills, Vuna; Lamb, Arr; Bower, Annett, Schonert, Williams, O'Shea, Thomas, Betty, van Velze (capt). Replacements: Creevy, Fainga'anuku, Rees, Senatore, Percival, Mulchrone, Fatiaki. Bristol: Slowik; Watkins, Tovey, Mosses, Amesbury; N Robinson, Kessell; Traynor, Brooker, Perenise, Townson, Sorenson (capt), Mama, Lam, Eadie. Replacements: Crumpton, O'Connell, Ford-Robinson, Joyce, O Robinson, Hampson, Jarvis.